Chris may hold the record for most appearances on Radio Misterioso, dating back over 10 years. Since that first talk, we have become friends, mainly because he refuses to be pigeonholed as a researcher or in his opinions. 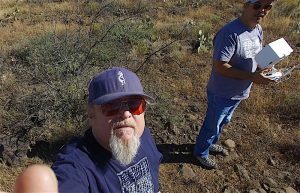 He described the UFO tours he conducts in the Sedona area, and although he guarantees nothing, says that about 1/5 of the tours actually result in apparent sightings of unexplained aerial phenomena. He described his approach to the tours and how he “deprograms” his audience about what they think UFOs might be. We spoke about language, culture, and media and how it affects what people think they see and experience during a paranormal encounter. He also mentioned his theory that UFO activity seems to increase in this country during military drawdowns and when the party in the Oval Office changes. Also discussed: How we could possibly put ourselves in a state of mind to experience the paranormal, the futility of trying to explain where a researcher may be coming from, and a strange cattle mutilation that occurred close to a rancher’s home while he was watching a herd slowly circle something in a pasture. As always, a great “inside baseball”- type talk with an experienced researcher and author. Photo: Chris grabs my drone out of the air near Sedona, AZ. This entry was posted in animal mutilations, Authors, new research, researchers, sightings and tagged Chris O'Brien, subjective experience. Bookmark the permalink. The problem with Chris and Stanford is he never holds him to “his word”. Ray has promised many things “on air” only to fail completely by producing anything he said he would do. He is not a man of his word. Too bad. Chris is basically Ray’s (official?) biographer and has (hundreds?) or over a 100 hours of audio tapes interviewing Ray. He has a vested personal and financial interest in protecting Ray from any serious critiques that Ray is very vulnerable to. Yes, I think Ray will ultimately be proven wrong and even be considered a fraud by many. Imo…It’s no big leap to know why Ray ends-up at Goddard… he’s nothing but a disinfo agent run by the PTB Spook Deep State Social Engineers. He’s just like LMH or Doty but from another crazed angle pretending to be “the expert”. Maybe he knows some MIC UFO sheeit, but he’s got nothing on Gorp! IMO…Ray is a control, possible dupe, and well beyond eccentric. No doubt Ray is into “psychic magic” and some weird occult too… Chris is in love with this same kind of trickster crap too. It’s dark magic that harms their opponents or attacks their spook agendas. Imo…Ray is 100% con, con, con… for the MIC Spooks of the PTB. Maybe they MK-Ultra’d Ray’s brain too? Critiquing what you see as unfounded claims with what many see as more unfounded claims will probably not get you far. I’ll ask Chris what he thinks. Ray is not a con-man. His paleo and ufological work are real, cutting edge and world-class. YOU obviously don’t know what you are talking about and have no clue about who I am or who Ray is, for that matter. And you are making pretty serious, completely unfounded accusations about me and Mr. Stanford. When the National Geographic article comes out, we’ll see what you have to say there…. I’m not making unfounded claims, as I can prove what Ray said and has not produced. It’s already well documented at the Paracast Forum in multiple threads, but this is dirty water under the bridge. No need to dredge-up what Chris has to say, because he’s posted numerous times at the Paracast anytime people question what Stanford claims. Stanford thread topics quickly become a can of worms that poison all controversy about Stanford, and “the control” is implemented. The thread topics are closed and everyone is literally silenced unable to post. We all have blind-spots, and we’ll protect our closest and respected friends. Stanford is a longtime mentor and very close respected friend of Chris. Plenty of people got burnt out from posting at the Paracast. They drove away Burnt State and many other good people. Did Burnt finally visit you in CA? Did you see him (Robert/Burnt) in Canada? You should get him on your show again to find out what he’s up to. Maybe he posts somewhere else? I do think Stanford is a high functioning “kind of savant”, laser focused, and obsessively driven personality. An OCD collector. Not surprising he found the dinosaur tracks. His OCD and/or “savant talents” may be why he was duped, or he’s playing his PSYOP role. Chris is obviously blind to all of it, since he believes Ray’s ideas and proofs. Thanks for not being dogmatic or trollish. That is rare and appreciated. I did meet up with Burnt/ Robert in Canada. We went to visit the Wilhelm Reich museum in Maine. A longtime pilgrimage/ bucket list place for me. He weaves in and out of the subject depending on his interest level. I think that’s a good course to take. Did you do an audio post about your trip and travels? Good to know to spent some time with Burnt. You remember how Stanford was with Walter Bosley on your show? He can be “impossible” in some respects. I know Tracy T. got “into it” bigtime w/Stanford, and he said that he would walk away from the documentary/movie if Stanford was going to be in it. Ok, I’m shutting-up about it. Probably should have just kept my mouth shut. I don’t want to dwell on much personal stuff, so I probably will keep my visit with Burnt private. You don’t have to keep your mouth shut if you’re polite and stick to issues. I don’t see why anyone should have a problem with bringing up a dissenting opinion. I encourage it. Thanks to Chris O’Brien for recommending Afro Celt Sound System for the outro music. I never heard of them before. Love, love, love their sound and gotta get them into my collection.